Can you get off the island? AGAIN?! Everybody knows that zombies are one of the best creatures to have in an apocalypse style video game. Dead Island is one of those games that makes it both fun and challenging to swing a bat into a wave of zombies. Developed by Techland and published by Deep Silver, Dead Island first made its debut in 2011 being released for PC, Xbox 360 and Playstation 3. Mixing up Action-RPG elements and horror-survival themes, players assume the role of a survivor during a zombie apocalypse on a tropical island and must find a way off the island. In 2013, Dead Island Riptide was released, being a stand alone expansion in the series: same characters, different environment. As of May 31, 2016 Dead Island Definitive Collection was released. Taking a great game and fixing it up to for the current generation of consoles, Dead Island Definitive Collection comes with both the original and stand alone Dead Island, every piece of DLC released for both games, and every patch and update for both games as well. Experience the events of Dead Island in a full remastered style. Seeing everything in clear and crisp HD with vastly improved graphics, more rendered game models, and a new photo-realistic lighting system that creates shadows and shading based on the actual environment. Have a blast completing quests and leveling up your character of choice by enduring the onslaught of zombies that stand between you and survival. Bash in skulls with a modified nailed bat, slice off limbs with an electrified throwing knife, or whatever weapon of your choice. Taking the melee route or attacking from a distance with firearms, you’re sure to feel your adrenaline pumping when you see zombies running at you trying to take your life. Watch your back too: they will stab you if you’re not paying attention. 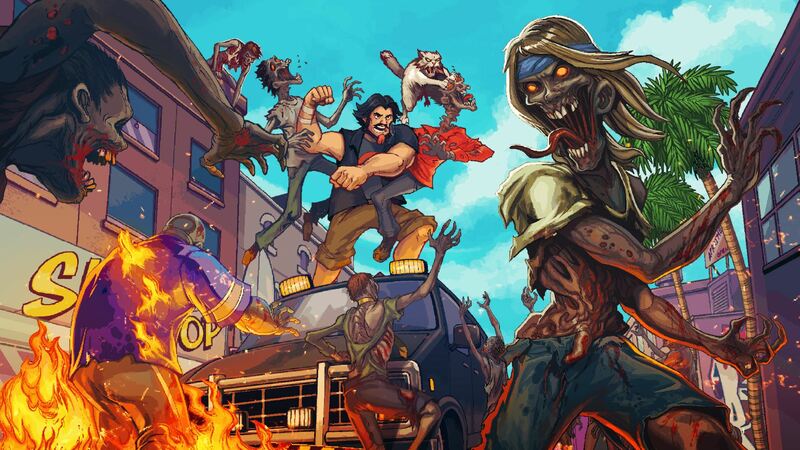 Having fun in a zombie apocalypse in single player mode is fun, but it will be even better when going online. Form up to a full party of four and take on the dead as a group. Whether the group is going for a speed run through the game, exploring the ins and outs of the island, or just goofing off, you’ll feel like you’re actually there with the atmosphere. Travel from the luxury hotel near the sandy, bright beaches, through the dense thicket of the jungle, and even the dangers of a deserted city. Along the way, you’ll see over turned cars, crashed planes, and countless bodies (some of them you left behind) just adding to the atmosphere of this horror-survival series. Dead Island Definitive Collection can be purchased for Xbox One, Playstation 4, or PC both digitally and physical copy for just $39.99; two full games, all DLC, patches and updates included. As an added bonus for buying the collection, the game comes with a free bonus game: Dead Island: Retro Revenge, a 16-bit side scrolling game that puts a new spin on the game. If you’re new to the series and want to experience the zombie hordes, this is a pretty good deal for your wallet. If you’ve played the original games, but never experienced the DLC content, now is a good time to pick up the game and see how you’ll fair against these updated zombies. However, if you just want to buy just one of the Dead Island games, they are available individually for $19.99, still fully remastered with all content for the game included, but this option is only available through digital download. Either way, be prepared to fight, flee, and most of all, survive. Can you escape the island for a second time?